At this point in the project, the door is unattractive. 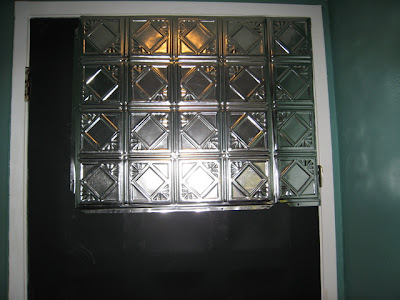 To improve the appearance of the door, I purchased nine 24X24 tin tiles from The American Tin Ceiling Co. These tiles are meant for the ceiling and will require some modification. It requires trimming some of the tin pieces with tin snips, they were then secured with Liquid Nails Construction Adhesive. You should wear gloves, otherwise you will cut yourself. I started at the top and centered the first uncut 24X24 tile on the top of the door. 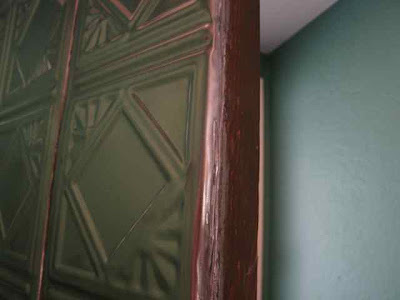 The part of the tile that is usually used to secure the tile to the ceiling should be bent on the edge at the top of the door. You can the secure the tile with small nails. On either side of the full 24X24 tile, I trimmed and secured the cut ceiling tiles. I trimmed each piece so that they would protrude slightly over the edge of the door. This way you can bend the edges to create a smooth edge. As I worked my way down the door, I used small nails to help secure tiles, while the glue was drying. Be sure to glue the backs and back connecting edges of the tiles. The tricky part is cutting around the door hardware, be sure to measure and take extra care so it will look flush with the door. For me, it helped to remove the door hardware. 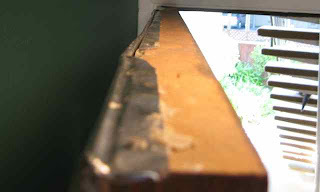 Once the door is completely tiled, it is time to take care of those sharp edges. Since I cut the tiles slightly bigger that the door, I was able to bend the edges down towards the door. I then filled in this area with GE Gray Aluminum and Metal Silicone Sealant. I then used a GE Clear Aluminum and Metal Silicon Sealant around the edge of the door hardware. If you had a peep hole, be sure to drill out the hole for that and re-install.